residents it was also a blatant lie. In February 2013, when H&F Conservatives ran our council, they used tens of thousands of pounds of tax payers' money to put a glossy magazine (see picture) through every letterbox in the borough. 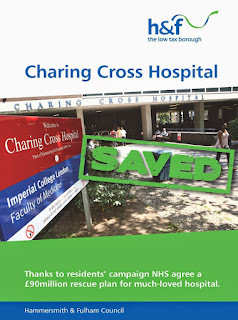 On the cover they had blazened the word "SAVED" across a picture of Charing Cross Hospital. By any measure, that was a blatant lie and the public duly punished them for that and much more at the subsequent local elections in May 2014. Far from learning the lesson of this they're still up to their old tricks. So if you have received an email, a letter or a petition from H&F Conservatives claiming that Hammersmith and Fulham's new Labour administration is planning to reduce the number of bin collections or even contemplating reducing the borough's bin collection then let me be very clear. That is also a blatant lie. The Council will retain the weekly bin collection service. 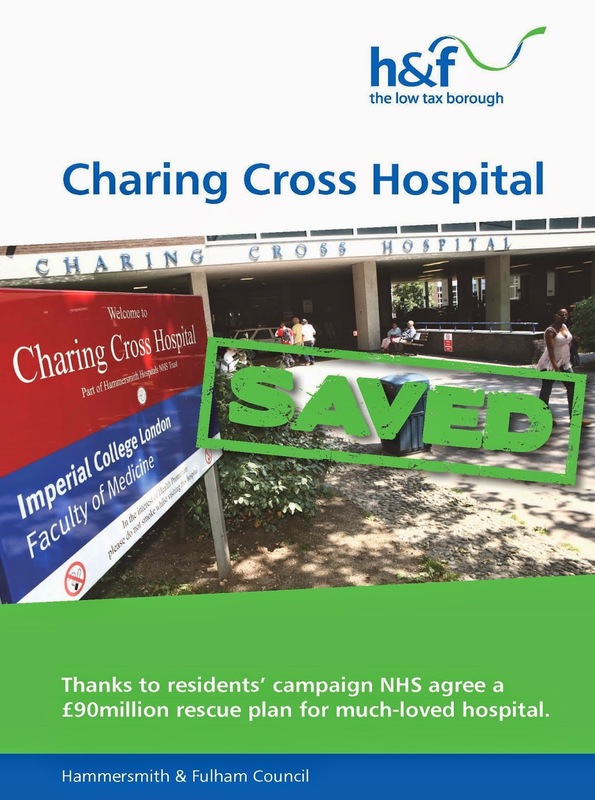 In fact, the borough's cabinet has not ever considered reducing it. The current bin service will be retained in full for as long as there's a Labour administration in Hammersmith and Fulham. Refuse collection is a core service so we will keep that and other essential services despite David Cameron (Con), George Osborne (Con) and Greg Hands (Con) introducing the biggest central government funding cuts to this borough in a generation. Ironically, the last major cut to the borough's environmental services was made to the street cleaning service by Cllr. Greg Smith and his fellow Conservatives on 11 November 2013 - almost six months before the residents of Hammersmith and Fulham removed H&F Conservatives from office. Greg Smith is now the leader of the borough's Conservatives but back then he was the council's cabinet member responsible for the street cleaning service . You can read the official council papers here. They're insightful as you'll note that while H&F Conservatives' half a million pounds cut was agreed in November 2013, they also rather sneakily decided to delay its implementation to June 2014 - a month after the date of the local elections which they had strongly believed they were going to win. There's more details about H&F Conservatives' cut to street cleaning here. The Conservative government's massive cuts in public spending have forced half of all councils up and down the country to reduce the frequency of refuse and recycling collections but, for as long as there is a Labour administration at our local council, that’s NOT going to happen here in Hammersmith & Fulham - and that's a guarantee.